Jenna D'Angelo and Faith Sandberg in How To Be Safe. Photo by Rachael Elana Photography. BOTTOM LINE: Opposites attract when a friendless agoraphobe and an aggressive daredevil meet unexpectedly while using public transportation. How To Be Safe delves into the lives of Willow (Jenna D’Angelo) and Audrey (Faith Sandberg), two women completely at odds, and the unlikely friendship that develops between them. Audrey, a terrified recluse, leaves the house for the first time in six months and decides to try riding the bus. On her ride she meets Willow, a young, harsh recovering addict who argues with the bus driver over fare until Audrey offers up her own metrocard to cover the difference. The next day, Willow shows up unannounced at Audrey’s doorstep, and a beautifully crafted relationship starts to take shape. Sprinkled in are scenes of Willow outside the apartment at the rehabilitation center, where she interacts with her counselor Scott (Brandon Ferrero), and the other (unseen) patients. These interactions reveal Willow’s manipulative nature and her desire to intensify her own banal life experience, specifically through self-harm. 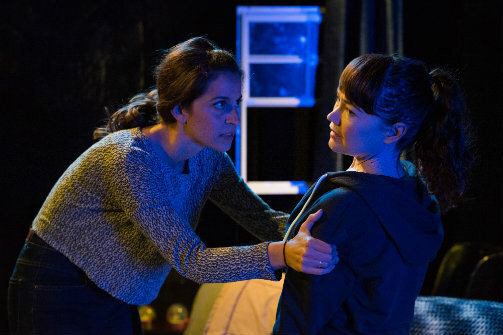 Powerful monologues by both lead women express their unhappiness with the lives they feel trapped in and their longing to experience the world differently. Ashley J. Jacobson's writing is excellent. The two female lead characters are complex, unique, and fully fleshed-out; their interactions are engaging and sincere. D’Angelo and Sandberg give truthful, nonjudgmental performances that never seem cliché or formulaic. The approach to mental illness is nuanced, and it doesn’t shy away from the ugliness, beauty, joy, and pain that come with mental disorders. The peripheral character, Scott, exists mainly as a plot device, and he is perhaps not quite as full and genuine. This is no fault of Ferrero, and as Scott is not the main focus, it didn’t significantly affect my overall reception of the play. A distracting and unnecessary element is the constant changing of scenery. Stage right is a fixed setup of Audrey’s apartment: a couch, table, fish tank, television, and window. On stage left, large black cubes are used in various formations to create Willow’s bedroom, a bus, and a group talk area at the rehab center. The cubes are big and clunky, and the transitions are slow and loud, so the whole effect just isn’t ideal. If only director Cezar Wiliams had found a way to create similar settings with minimal sliding, banging, and stacking. How To Be Safe is a timely piece of theater that dives into the extremes of emotions and perceptions that seem inherently universal. It asks us to question our own understanding of the world and ourselves. It’s also refreshing to see a piece centered around two strong, independent female characters choosing to own their agency and face the world head on, each in her own way. I recommend it to all audiences and hope that it gets produced in more venues in the future. How To Be Safe is by Ashley J. Jacobson. Directed by Cezar Williams. Set Design is by Ashley Arvidson. Lighting Design is by Sarah Livant. Sound Design is by AlmedaBeynon. Stage Manager is Hanako Rodriguez. Assistant Stage Managers are Katie Sammons and Josiah Brown. Costume Design by Te Ting Lee. The cast is Jenna D'Angelo, Brandon Ferraro, and Faith Sandberg.